Junior Dante Hunter Poe grapples over the ball with his opponent from Coral Springs. The boys team lost 13-12 to Coral Springs on Feb 27, bringing their record to 2-1. 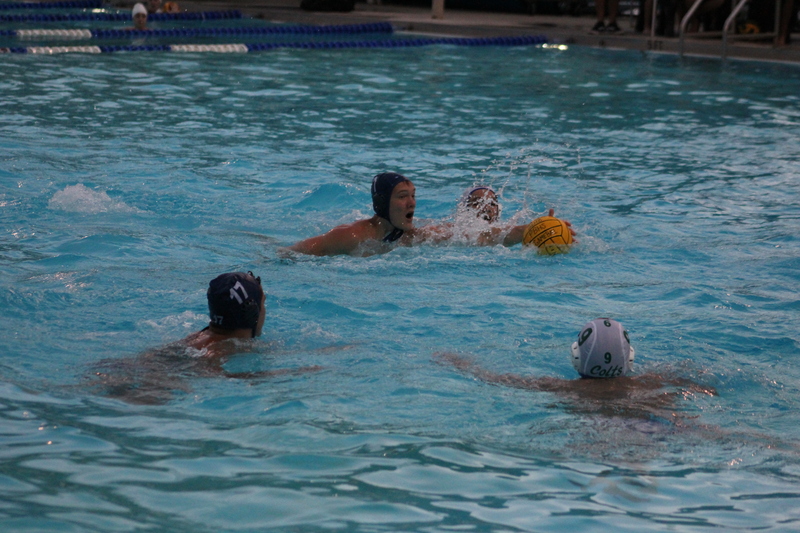 The boys water polo team had its first match on Feb. 8 against South Broward. The team is working towards its goal of getting further in playoffs than it did last year. The boys team has a record of 2-1 for the season so far, stopping their winning streak on Feb, 27 with a 13-12 loss to Coral Springs. The team as a whole, and as individuals, have been working on ball movement and other skills as well as minimizing fouls and the amount of players ejected. “My personal goal is to be the best defense in Broward County,” said Hache said. The next game will be on March 7 at Nova against St. Thomas.